The natural grey exposed “stack bond” block perfectly enhances the modernist architecture. There are few products that can adapt to a vast array of architectural styles, remain cost-effective and meet the ever demanding energy code criteria like Omni Block. 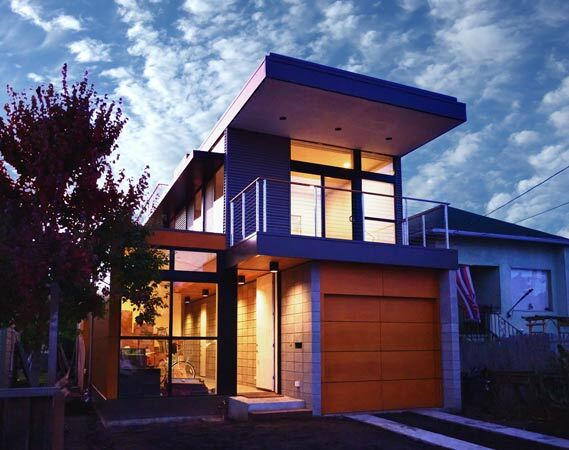 The home at left and below is such an example; an Eichler inspired modernist home. Architect Robert Swatt used exposed Omni Block in northern California proving that even in the most stringent structural zones Omni Block is a product of choice. Omni Block has been engineered and used in hurricane and tornado regions as well. Omni Block is a stand alone wall system that should not be furred, additionally insulated or sheetrocked. It is recommended to plaster the interior of the block with standard sheetrock compound to exactly match any adjoining interior sheetrock (see INSTALLATION section). This home was featured in Dwell Magazine. 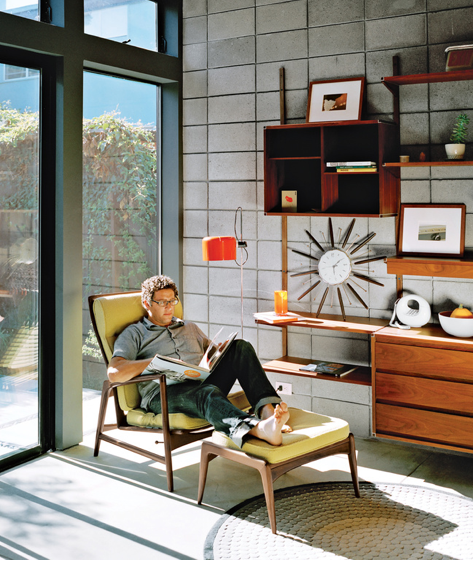 (https://www.dwell.com/article/what-would-eichler-do-315008a6). 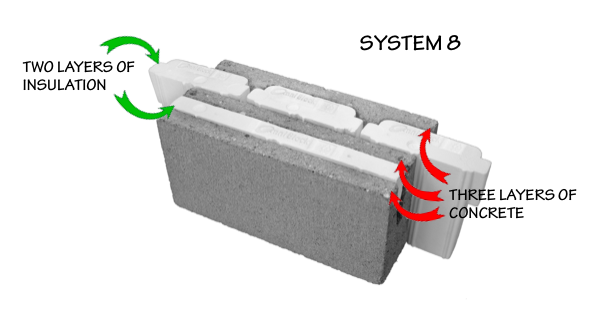 Omni Block is a patented insulated cementitious masonry unit (CMU) wall system which combines the benefits of indigenous aggregates, Expanded Polystyrene foam insulation, thermal lag (the delay, disruption and redirection of heat flow), exposed thermal mass on the interior side which allows the absorption of heat and air tightness. This combination results in a thermally efficient wall system with a high R-value and is consistent with well-known and widely accepted thermal performance concepts. Omni Block insulation inserts are manufactured using safe, clean, non-toxic, and non-polluting processes, which in turn, result in a product that agrees with the environment, is sustainable, and adheres to green building principles. The raw material is a “by-product” of oil refinery waste. The block units are manufactured utilizing inorganic elements, which are in abundant supply and locally quarried. 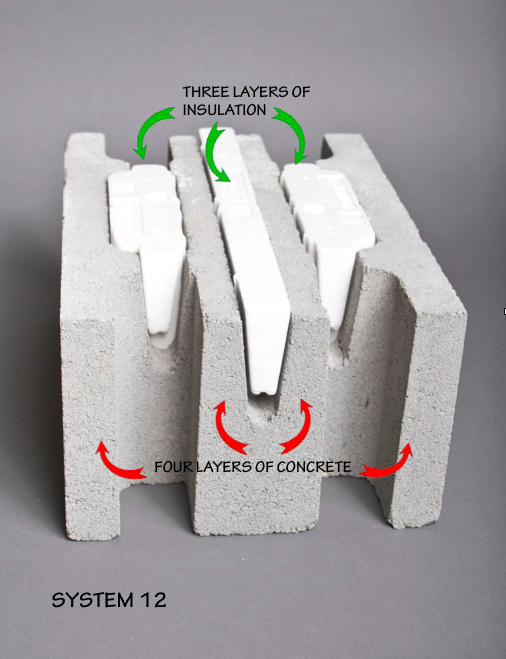 Omni Block is exceptionally innovative because it is a re-engineered ‘age-old’ regular cinder block with unique cells that are easily filled with uniformly molded Expanded Polystyrene foam insulation inserts. The various trades or sub-contractors that interface with Omni Block understand that it is virtually the same as working with regular cinder block. Omni Block is the most cost efficient and competitive insulated building material available. Compare Omni Block’s per square foot pricing to that of other wall systems. Cinder block does not burn and neither does Omni Block. It has a 2.7 hour fire rating making it fire resistant. Compare the results between a 2 hour fire-rated insulated metal stud wall and a masonry wall by viewing the metal stud drywall fire test and masonry wall fire test. Both walls were subjected to approximately 2000°F in a heat chamber for 2 hours. Omni Block structures are permanent, durable and termites cannot eat it and since Omni Block is an insulated heavy-weight building material, sound does not travel through the walls.